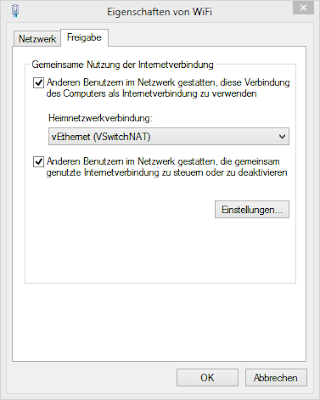 In my last posting i explained how to configure a vEthernet adapter to get connectivity to the internet. But there was one "problem": You had to provide one seperate IP for each virtual host, you want to connect to the internet. Open the tab "Sharing" and enable both Checkboxes.